When most people think of Peru, their mind immediately goes to the treasured Machu Picchu, which stands as one of the most astounding wonders of the modern world. But every adventure travel photographer seeks new and undiscovered lands. 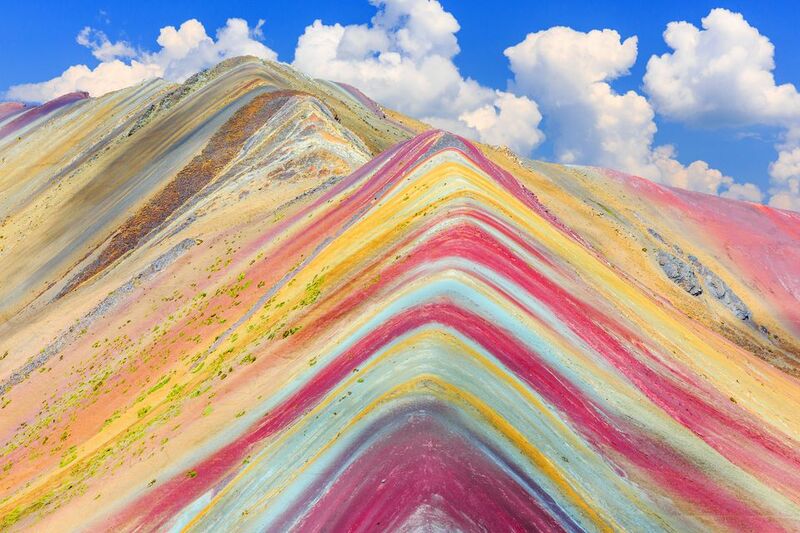 The Rainbow Mountain, just a short drive from Cusco, offers up stunning vistas little known to travelers and locals alike, making it the perfect location to practice your travel photography skills in one of South America's most stunning natural landscapes. Brandon and LeAnn Morris of FlashpackerConnect recently discovered this captivating mountain landscape and put it on the map for adventure seekers everywhere. With few travelers knowing about it, and even fewer visiting, the Rainbow Mountain and surrounding landscape will continuously surprise you. The couple, pioneering new, adventurous routes, are taking travelers here in as little as a day trip from Cusco, the city that serves as the basecamp to places like Machu Picchu, the Inca Trail and the Sacred Valley of the Incas. Read through to learn more about Peru's most photographic mountain and how FlashpackerConnect can tailor a trek for your specific photography interests. Throughout the FlashpackerConnect journey, you will pass through a photogenic, vibrant green valley with the snow capped peak of Ausangate towering in the distance. You will see hundreds of roaming alpaca, and have the chance to experience and document how Quechua people live. The hike, at just under 10 miles round trip, takes about 3 hours to reach the top. Here you can photograph the 360-degree view of the painted hills, Ausangate Mountain, the lush valley below. You will also have the added benefit of relishing in the fact that you are standing at 16,535 feet - and you made it! Photograph landscapes like this in the Ausangate region, a place where the natural scenery changes with every step. Here you can explore hanging glaciers, turquoise lagunas (lakes), painted hills, and dark red valleys. As you make your way to the Rainbow Mountain, you will feel as though you are the only traveler in this vast expanse. This is one of the few places left in this world where you have the mountains to yourself - an area where local farmers outnumber trekkers. Practice your photography and make sure to document your fellow travelers as well, as this landscape was made for the shots that show scale, like the photo pictured here. Meet local alpaca farmers, who will tell you of their experience farming these mountains. Although life on the mountain isn't easy, the locals are friendly and offer a perfect way to capture the culture of these idyllic mountains. Make sure to ask permission before photographing locals, as this common courtesy can go a long way in Peru. FlashpackerConnect's trip crosses over five high mountain passes, making it a tough trek. Not sure you can handle something so demanding? Try the company's recommended style, and travel on horseback. This offers a more leisurely experience, where it's easy for you to jump on and off the horse to capture the landscapes you will encounter. Additionally, horse culture is a huge part of life in the Peruvian Andes, offering another photographical element to your journey. No matter your choice of trekking style, you will have the opportunity to document and experience colorful glacial lakes, all while sleeping under the brightest skies you will ever see. After a hard trek, you can also soak your muscles in the surrounding area's natural hot springs. A final way to document your FlashpackerConnect journey is the tastiest of all. With a hot breakfast prepared upon arrival you will enjoy feasting on scrambled eggs with cheese, fried bananas, local homemade granola, and fruit, along with hot maca (a local root based drink) and coca tea. Additionally, you will be given snacks to munch on throughout the trek, such as fruit and biscuits, and once you get back to camp, the real feast begins. Prepared by Peruvians you will have a spread of local dishes awaiting you. Lunch typically consists of an appetizer such as fried tortillas stuffed with cheese and avocado, stuffed peppers, and quinoa or potato soup. This is a great time to try an aerial shot of the many cultural delicacies you will enjoy.